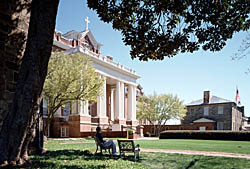 St. Mary’s College, now Saint Mary's School, is the oldest continuously operating school in Raleigh and the third oldest school for girls in North Carolina. Founded in 1842 under the auspices of the Episcopal Church, the school was the successor to the short-lived Episcopal School of North Carolina, established for boys in 1833. In its early years, St. Mary’s served as an important cultural center for Raleigh. 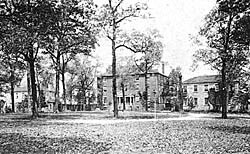 During the Civil War, the school was a haven for students from occupied areas of the South, among them Mildred Lee, youngest daughter of Gen. Robert E. Lee. Mrs. Jefferson Davis and her children resided on campus during the summer of 1862. The largely wooded campus covers approximately 23 acres and encompasses an eclectic group of buildings. East Rock (c. 1833) and West Rock (c. 1834) were crafted of remnant stone discarded during the construction of the State Capitol. Between them stands Smedes Hall (1835-1839), a three-and-half-story, Greek Revival style building, named in honor of Rev. Aldert Smedes, first rector and president of the school. St. Mary’s Chapel (1855), a Gothic style wood church, was likely copied from a patternbook of Richard Upjohn, architect of Raleigh’s Christ Episcopal Church. Later historic buildings include the Gothic Revival Language Arts Building (1887), and Neo-Classical Bishop’s House (1904) and Pittman Auditorium (1906-1907). The school has long enjoyed a high academic reputation. In the late 1800s, Vassar College admitted St. Mary’s graduates without examination. For most of the 20th century, the school’s college preparatory curriculum was complemented by junior college courses. Recently, the school returned to a curriculum solely of high school-level preparatory courses. Although St. Mary’s is located only a few blocks west of the State Capitol , until the 1880s the area around it was sparsely populated. Large suburban estates such as the Boylan, Tucker and Cameron plantations bordered the school. After the streetcar line was extended down Hillsborough Street in the early 20th century, the school’s environs were subdivided into neighborhoods. Subsequent redevelopment has resulted in the demolition of nearly all of Hillsborough Street’s 19th-century residences. Today the St. Mary’s campus represents one of the few reminders of Hillsborough Street’s earliest years. Its grounds also stand as a remarkably intact green space near the heart of downtown. St. Mary’s College changed its name to Saint Mary's School in 1998 when it closed its college program. The school is located at 900 Hillsborough St. Most of the buildings noted above have been individually designated as Raleigh Historic Landmarks. The campus is open to the public for special events and by appointment. For further information visit the school’s website.